First and foremost I would like to thank all the friends, family and neighbours that have paid respects to my dad since Sunday afternoon. The outpouring of support and love from all of you has made these difficult days a little easier to deal with. I would also like to take this time to thank the nurses and doctors that have come by our house for taking such great care of my dad. 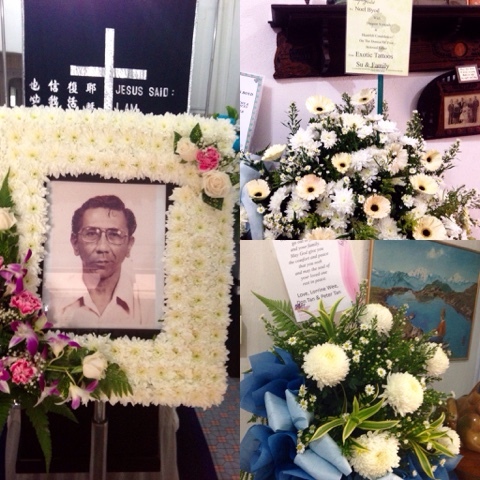 To Aloysius Hoeden (Divine Casket), you were such amazing help when dad passed away. The help you rendered is priceless and for that I thank you. It's no secret that I'm daddy's boy. I've been told many a times that I'm similar to my dad in many ways. I think it was this reason that he forgave me when I did wrong on many occasions. I've faced many demons in my life and each time he was there to lend support when I needed it most. I will always remember the many drinking sessions we shared. Well I'll also remember the many times my mother told me off for getting my dad drunk. As an entertainer my job and mission is to bring smiles and laughter to people. To me, the best job I've ever done was to make my dad laugh and smile whenever I was blessed with his company. Somehow I managed to do that even when my dad was bedridden. For that I am blessed. To my mom, in front of all these amazing people, I want you to know that you are not alone. You have the three of us that will do everything in our power and might to take great care of you. To my Pa, as selfish as this sounds, I don't want to let you go but I know you're somewhere better now. I look forward to the day where I get to meet you again. I love you.